Buffalo in the late 1800s was a city of enormous economic wealth and innovation. For about 18 months, it was also home to Samuel Clemens, better known as Mark Twain. It was here, as part-owner and editor of the Buffalo Express newspaper, that Twain transformed into the subversive rebel that would define his legacy as a great American author. Mark Twain's "Fortifications of Paris," which first appeared in the Buffalo Express, was later reincarnated in book form. Born Nov. 30, 1835, Mark Twain came to Buffalo in 1869, a young man in his 30s from poor Southern roots. Here, however, he lived a much different and luxurious life, in a mansion with servants at 472 Delaware Ave. By the time he left for Connecticut in 1871, Twain's unique brand of social criticism was well prepped for later works like The Gilded Age, Tom Sawyer, The Prince and the Pauper and Huckleberry Finn. "I think what the Buffalo years taught him was that he was a writer and not a journalist," said Carrie Bramen, professor of English and director of the Gender Institute at the University at Buffalo. 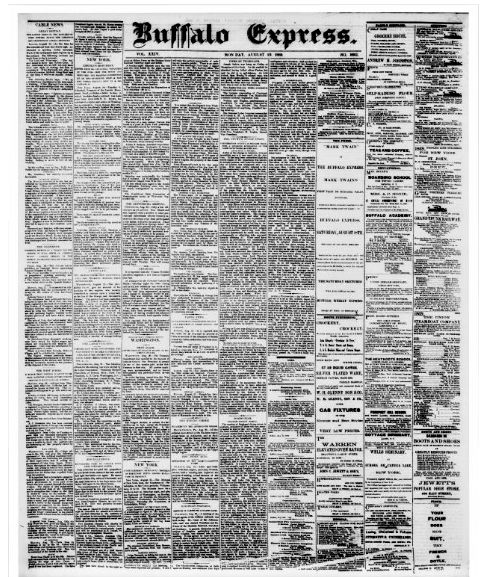 Bramen says Twain's first book, The Innocents Abroad, became a blockbuster hit shortly after he moved to Buffalo and he quite liked the fame and lavish lifestyle that came after it. "He needed that time for reflection, for observation, and the day-to-day grind of making deadlines, of managing a newsroom, was not to his liking." 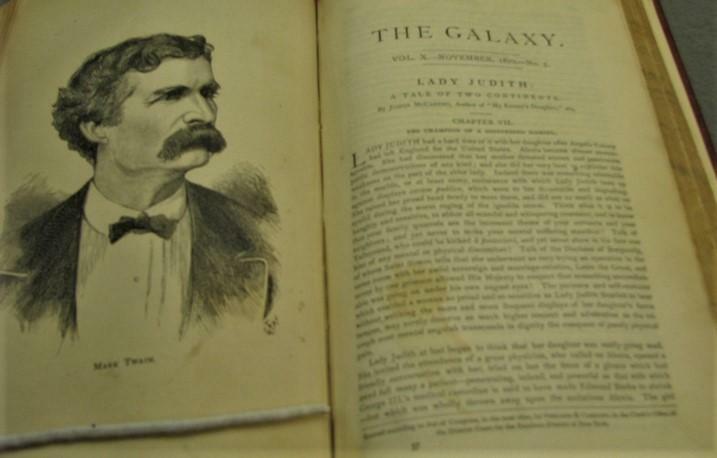 Thomas Reigstad agreed and noted that Twain also signed his first contract for regular contributions to the Galaxy magazine - later pruchased by the Atlantic Monthly - during his time in Buffalo, which also transformed Twain's "journalism." "Even something as simple as reporting the police docket was transformed by Twain into something more entertaining," Reigstad said. The emeritus professor of English at Buffalo State College and author of "Scribblin' for a Livin" said Twain's Buffalo Express stories usually had a nugget of truth - "and targets of his ridicule, for sure" - but they were fiction. "When he was a beat police reporter in San Francisco, he even got in trouble with the police for coming to the editorial aid, at least, of an Asian immigrant who was arrested and mistreated by the police, so it turned into more of an editorial than it did a police report," Reigstad said. "He did the same thing in Buffalo at the Express." Reigstad said the "mudslinging" of the period also shaped what turned into Twain's trademark outlandish political commentary, for example, in an editorial about running for governor of New York. WBFO's Marian Hetherly talks more with Thomas Reigstad about the development of Mark Twain's outlandish writing style. "The Mark Twain character is totally naive as a gubernatorial candidate and he's attacked on the left and the right," Reigstad said. "He's accused by 34 witnesses, supposedly, of having robbed a widow and her family - and then he's charged with being tarred and feathered in the newspaper way out in Montana for robbing some people at a cabin, when, you know, that never happened at all." Reigstad said Twain's Buffalo writings showed that he could make "something comic and perceptive out of serious blunder" and Twain even used himself as a target of ridicule - "and he did that for the rest of his life." Mark Twain's Southern Confederate roots with race and slavery dramatically changed while in Buffalo. Bramen said Twain's marriage to feminist Olivia Langdon in Buffalo influenced his ideas about gender, while her father - a wealthy coal magnate and ardent abolitionist - caused Twain to rethink his Southern Confederate roots about race and slavery. "While he was in Buffalo, he published his first story in the Atlantic Monthly and it was called "A True Story." It is a profile, a portrait of Rachel," Bramen said. "She was auctioned off in Richmond and her youngest son shouted out to her, 'I will run away and I will find you and buy your freedom.' Twain was incredibly moved by these stories from Rachel." Buffalo not only shaped the legacy we know today as Mark Twain the great American author, his writings of the period still ring true for media and others aroused by the Trump Administration, public corruption, hate crimes, Black Lives Matter, the #MeToo Movement and the like.